Сейчас Вы просматриваете программу, находящуюся в категории(ях): Офисный софт. Далее Вы сможете посмотреть полную новость программы, которой Вы заинтересовались. Для того, чтобы бесплатно скачать Anthemion Jutoh 2.64.1 + Portable, прокрутите страницу вниз до окончания полной новости и перейдите по указанным ссылкам. Приятного Вам скачивания! Anthemion Jutoh - программа для создания электронных книг буквально за несколько секунд из уже имеющихся файлов, используя New Project Wizard, а также создание e-book книг, используя встроенный стилизованный текстовый редактор. Обложки книг можно выбрать из шаблонов Jutoh's или создать свои при помощи встроенного кавер-редактора. Созданные проекты электронных книг вы можете продать на различных сайтах. Возможности: • Вывод *.epub, mobi для Kindle, *.txt, *.odt • Встроенный мастер создания проектов и обложек • Высокая скорость импортирования различных объектов в проект • Создание текстовых и графических заметок а также слайд-шоу • Речевой вывод синтетической речи MP3 • Проектировщик обложки • Проверка орфографии • Условное содержание • Гибкое средство конфигурации • Несколько стилей • Средство переопределения CSS • Настраивaемые атрибуты метаданных • Мастер страницы содержания • Поддержка алфавитного указателя • Поддержка сносок/примечаний • Полная поддержка USB • Фрагменты для хранения исследований • Рабочий стол для ярлыков и примечаний • Проверка книги с EpubCheck • Конфигурируемый запуск электронной книги • Оптимизация для iBook • Импорт и экспорт из различных форматов: OpenOffice.org , Word, TXT, HTML и др. • Поддержка ”гoрячих” клавиш • Доступ к нужным документам и приложениям через Jutoh Desktop • Резервное копирование материала и многое другое… Jutoh Benefits: Speed Fast to import your existing content, whether in text, HTML, or OpenDocument. Fast to create your Epub, Mobipocket or other format. Fast to edit content and switch between variations of your ebooks. Jutoh is written in C++ so runs at top speed — no frustrating delays. Multi-platform design Jutoh runs on Windows, Mac, Linux and various other Unix-based systems, and you can easily copy your files between machines of different kinds. One licence can be used on multiple operating systems simultaneously; and rest assured that if you buy a different kind of desktop or laptop, you don't have to leave your way of working behind and buy new software. Create ebook variations rapidly Thanks to Jutoh's configurations, you can describe differences between versions of your book — a different cover, a different title page, different formatting — all without needing separate projects. Just select a different configuration and click Compile. This is invaluable when you are distributing ebooks using different sites with slightly different requirements. Ebook checking gives you confidence Jutoh installs Adobe's EpubCheck and EpubPreflight checker programs, so you can easily check your Epub book for internal errors or problems that might arise with specific readers. The checkers are run within Jutoh, so you don't have to mess about with invoking the applications yourself. HTML, text, ODT, and Epub import Jutoh imports from a range of formats. Using an application such as OpenOffice.org or the OpenDocument plugin for Microsoft Word, your existing word processor files can be saved in ODT (Open Document Format) for import into Jutoh. Or you can import from plain text or HTML, or an existing Epub ebook. 'Configurations' allow extensive customisation Jutoh's configuration facility allows you to define a version of your book that has its own cover, style sheet, and even variations in content (such as a title page with text specific to a web site or publisher). Configurable ebook launching You need to check that your book looks good on a variety of ebook platforms. Jutoh lets you add viewer applications so you can easily choose the desired ebook reader for viewing your generated book. Spelling checker Check for typos with the built-in spellchecker, available in a number of languages. Keyboard shortcuts for high-speed editing Use keyboard shortcuts to make editing your projects fast and natural. Online Manual The comprehensive online manual documents all aspects of Jutoh. Help window The help window allows you to browse Jutoh manuals from within Jutoh, side-by-side with your work. You can maximize it to take up the whole window while reading a topic, or unpin it to show it in a window of its own. Scraps facility You can keep your research and random ideas: notes, pictures, and document and web links. 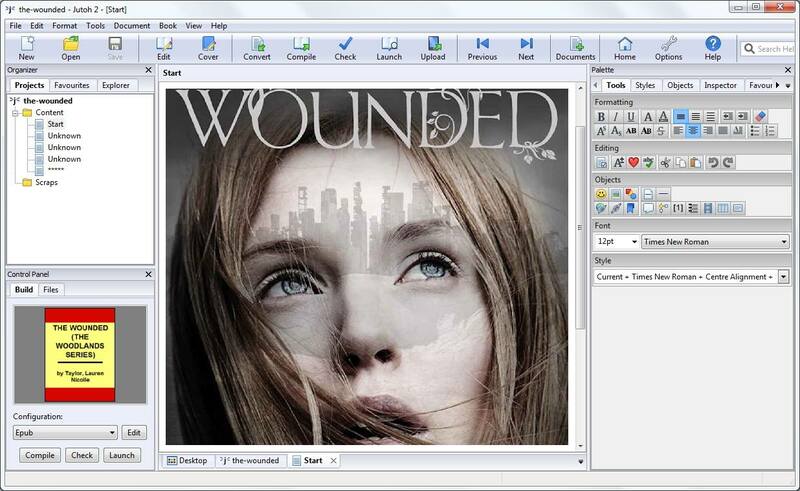 On Windows, use auto-paste to quickly paste scraps by copying text, graphics or web links twice in succession in any other application. Desktop Access to tools and applications is available via the Jutoh Desktop. You can customize the desktop look, add your favourite applications and documents, and create text and picture notes. You can even create a rolling slideshow of pictures to inspire you. USB memory key support Jutoh has superb support for external drives, such as USB memory keys. You can use an external drive for your documents and for all your Jutoh preferences, and you can even install Jutoh entirely onto the drive for complete portability. You can then switch between different machines and operating systems, taking all your documents and settings with you. Backup Facility The File Manager tool gives you an easy way to back up your precious files, without resorting to an additional tool. Specify File Sets that include all files of a given type, and create a backup with just a few clicks. You can also easily restore files from a backup archive. Search A global search tool helps you search all your open documents, allowing you to see all the search results in a list and step through them. 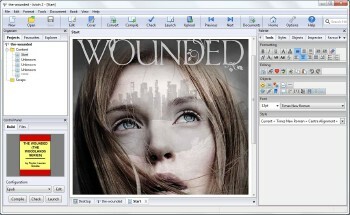 Slideshow Shows your image and collage scraps in succession, in a window or full-screen. Customization Specify notebook and journal font styles and sizes; and brighten up window backgrounds with the supplied textures, or your own. What's new in version 2.64: * Fixed duplication of styles when copying documents from another project using Document | Copy Documents. * Fixed a bug whereby Paragraph dimension units wasn't initialised to the correct value for configurations in new projects, causing a warning to be generated for Mobipocket configurations.